• Volatile Week Ends on a Brighter Note. U.S. equities rebounded from four days of selling on Friday, climbing the most in six months, but still posted sharp losses on the week. Investors had grown concerned over quickly rising bonds yields and a potential resulting slowdown in growth. Technology companies, which have performed best this year, led Friday’s gains, but fell 3.8% last week. Intra-day benchmark 10-year Treasury notes reached 3.25% earlier last week, its highest level in seven years, sparking fears that rising borrowing costs could slow corporate profits as well as within the broader economy. • Weekly Performance. For the week, the S&P 500 lost 4.07%, the Dow Industrials slumped 4.19% and the tech-heavy Nasdaq Composite fell 3.74%. • Import Prices Rise. Headline import prices surprised higher for September, with a jump in oil & fuels dominating an overall 0.5% price increase, following a 0.4% August decline, while import prices excluding oil were unchanged. Export prices were flat following a 0.2% decline in August. Separately, the preliminary reading of October consumer sentiment slipped, missing forecasts. • Raw Materials Producers Fall the Most. All 11 major sectors ended negative last week, led by Materials (-6.58%), Industrials (-6.40%) and Financials (-5.56%). Utilities (-1.26%) and Consumer Staples (-1.92%) fell the least. Technology (+13.46%) companies are still up the most this year. • Treasury Yields Fell Last Week. Treasury prices drifted lower on Friday as the U.S. Dollar strengthened for the first time in five days, sending the yield on 10-year notes slightly higher. For the week, following bouts of buying safer-haven assets, the benchmark yield fell 7.2 basis points to end the week at 3.162%. The U.S. Dollar Index fell 0.42% last week, ending at 95.221, and U.S. WTI crude oil sank just over 4%, ending the week at $71.34/barrel. Friday, October 19: Existing Home Sales. Domestic or international stocks - which are performing best? As can be seen from the chart above, the answer may depend on market regime, with international stocks outperforming for long periods, typically when the U.S. Dollar is weaker and international economic growth is stronger. Conversely, we are now in a period when U.S. growth is stronger than other developed markets, and the Dollar is strengthening - which has led to outperformance of U.S. stocks. 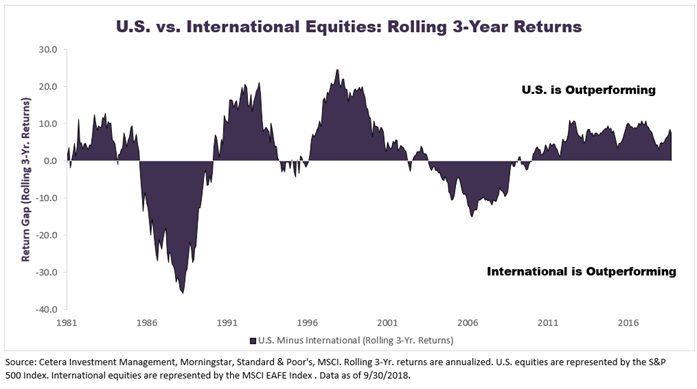 Reversals in the trend of outperformance are difficult to predict, and that is why we typically recommend that investors should maintain allocations to both international and domestic stocks in their portfolios. We also note that from a valuation perspective, the longer each cycle continues, the asset class which outperforms becomes more over-valued. At present, the valuations of developed international stocks are close to historical averages, while U.S. stocks, despite last week's selloff, are still above historical valuations. For this reason, a small international overweight may make sense in the current environment.